Clays N' Wings Shooting Instruction - As of Sunday May 21, 2017, Steve Biello and Clays N' Wings Shooting Instruction is proud and pleased to say they are part of the Paragon School of Sporting Professional Associates. 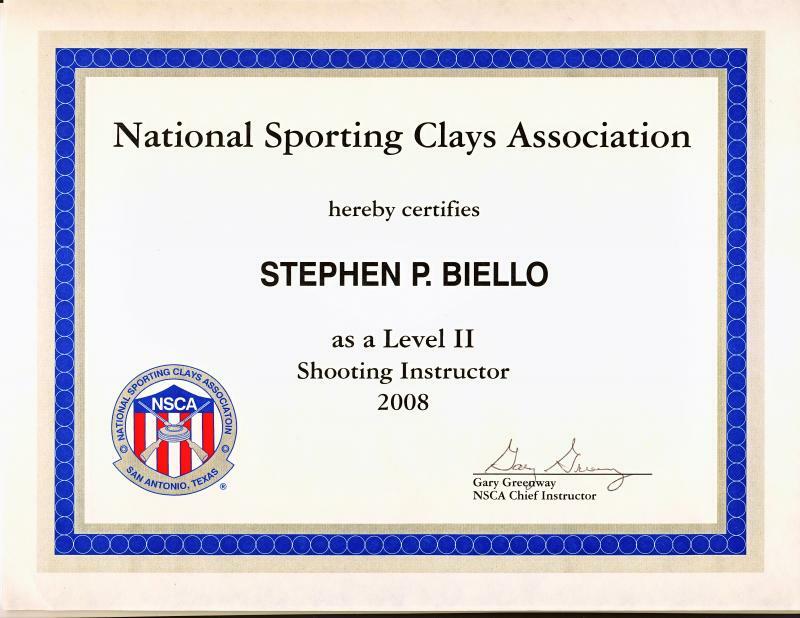 In addition to being an NSCA Certified level II Sporting Clays Instructor. I've received my certification through Dan Schindler's Paragon Center for Instructor Study﻿The Paragon School of Sporting requires 5.5 days of the most intensive training by Dan Schindler's Paragon Center for Instructor Study. Mr.Schindler's School of Sporting inspires, polishes and refines the Instructor Candidate to become the best. Paragon's methodologies and shooting process work, once learned and applied correctly, targets no matter what the presentation break. A Paragon School of Sporting Professional Associate. The Paragon School of Sporting requires 5.5 days of the most intensive training by Dan Schindler's Paragon Center for Instructor Study. Mr.Schindler's School of Sporting inspires, polishes and refines the Instructor Candidate to become the best. Paragon's methodologies and shooting process work, once learned and applied correctly, targets no matter what the presentation break. I believe that success in shooting is attained through the continuous proper applications of the core fundamentals, combined with a positive mental attitude for the game. I said "game" because that's what this is, so it should be fun. When you consistently apply those things I mentioned you'll be amazed at just how quickly you'll learn to break targets and that's when the fun starts. Over the years I've trained with some of the best shooters in the world. I've taken bits and pieces from my time with them and developed that information into an easily conveyed system that works. Stressing key fundamentals such as focus and the ability to read the target line are just a few of the fundamentals that will have you building a positive attitude, leading to even greater self-confidence. Whether breaking clay targets or bagging a cackling rooster pheasant, let me show you how. Sporting Clays, much like golf, is a game that is very easy to become addicted to. The market is flooded with all kinds of "goodies" one might need to play the game. Most of those type of items turn out to be a convienence more than necessity. I will help you weed out what you really need to play the game. I will also be happy to help in the choice of shotgun should you decide you want to purchase a new one specifically for Sporting Clays. The only Paragon School of Sporting Professional in Pennsylvania. Cedar Creek Sporting Clays, Millvile N.J.
Hopkins Sporting Clays, Kennedyville MD. Lehigh Valley Sporting Clays,Coplay PA.
M & E Sporting Clays, Hamburg PA.
M & M Hunting / Sporting Clays, Pennsville N.J.
Pintail Point Sporting Clays, Queenstown MD. Rock Mountain Sporting Clays, Meshoppen PA.
Schrader's Bridgetown Manor, Henderson MD. Warriors Mark Wing Shooting, Ginter PA.
Cole Gunsmithing, The Beretta Experts. Game Creek Hunting Farms, Pilesgrove N.J.
Hopkins Hunting , Kennedyville MD. M & M Hunting , Pennsville N.J.
Warriors Mark Wingshooting Lodge, Ginter PA.
Wing Pointe Hunting, Hamburg PA.
Just about any shotgun capable of firing more then one (1) shot is preferred. If you don't own a shotgun, no problem, I will be glad to provide a loaner gun FREE OF CHARGE. If you don't have your own let me know. I'll make sure I have them for you to use. If you wear bifocal lens glasses please bring standard lens glasses if available. 2 to 4 boxes of shells depending on the length of your lesson and your prior shooting experience. Warm clothes for cooler days. The less bulk the better. Copyright 2008 ClaysNWings shooting Instruction. All rights reserved.